Another weekend of competitive BC Provincial Cup action is over and the semi-finalists in all sections are now known. There was drama, goals, sending offs and cup shocks throughout the four mens’ sections of the competition and AFTN took in four of the sixteen matches played, with a fine spattering of ex Vancouver Whitecaps, and Canadian and Jamaican internationals on display. First match up for us was Friday night’s all VMSL clash between Metro-Ford Wolves and long time rivals Columbus Clan, in front of a crowd of a couple of hundred at the Coquitlam Town Centre complex. The game took place on Ted Fridge Field, which was very apt as it was freezing. It was a perfect winter’s night for football. Shame it was taking place in April. Metro-Ford Wolves had put out third seeds, and defending Provincial Cup champs, ICST Pegasus in the first round and the home side went for it from the off. Columbus probably went in to the tie as slight favourites, but their backline looked slow from the start and Wolves’ speedy attack soon punished them, taking the lead, with what was to prove to be the only goal of the game, in the sixth minute. Carlo Basso ran on perfectly to a through ball and although the keeper did well to save his initial shot, (pictured above), Jovan Blagojevic was on hand to follow in and net the rebound. Columbus slowly came back in to the match and came within inches of the equaliser when a header from a free kick went narrowly past the left hand post as half time approached. Wolves thought they had a second three minutes into first half stoppage time. Basso turned the ball into the net, but the linesman had his flag up for offside, in what looked to be a very tight decision. The game was spoiled by a very officious referee, with several bookings handed out and nitpicking little decisions here and there, and the official was in the thick of the action again in the 58th minute when he disallowed a second Wolves goal for offside. With time running out, Columbus pushed for an equaliser and came within inches of getting it on several occasions, the closest of which was a header off the line with just minutes remaining. It would have been harsh on the home side to not hold on and there was joy and relief at the final whistle for the Wolves players, officials and fans. 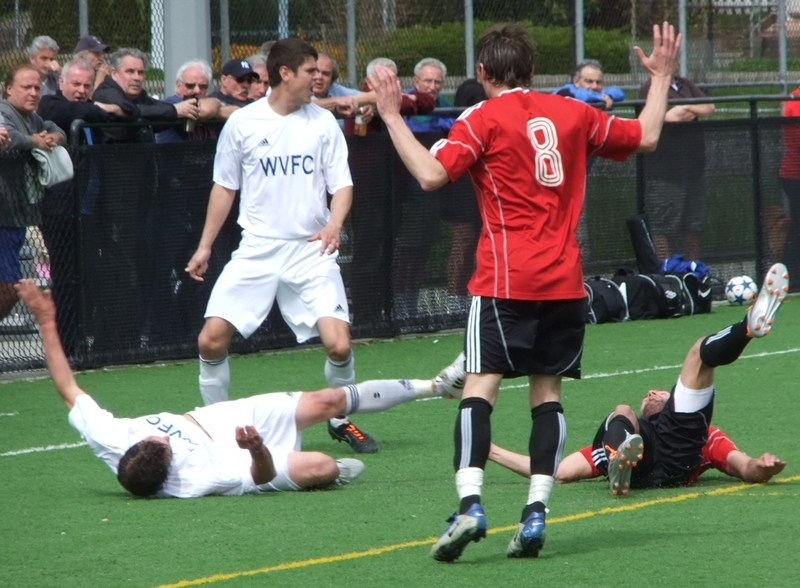 The Coquitlam side will now host another VMSL side, Delta United Hurricanes, in next weekend’s semi final. Delta came through a tough test on the island, beating VISL Champs Gordon Head Applebees 2-1 in Saanich. Metro-Ford Wolves are where former Whitecap Alfredo Valente plays these days and the former USL Championship winner wasn’t the only ex-Cap we saw in action this weekend. His fellow 2006 and 2008 USL Championship winners, Jeff Clarke and Steve Kindel, took to the field at Ambleside Park in West Vancouver for Surrey United Firefighters, a side player-managed by another former Whitecap, and Canadian international, Niall Thompson. When we started our coverage of the 2012 Provincials last week, we mentioned that we wanted to do a “Road to Wembley Burnaby Lake” feature, where we would go see a first round tie in the ‘A’ and ‘B’ Cups and then follow the winners through each round to the final. We already hit problems when the West Van v Bays United match went in to extra time last Sunday, and we thought we’d missed the NVFC Campobasso v North Coquitlam Blues match as a result. Turned out, that game went to pens and we got a brief glimpse of it as we drove past on Highway 1! Well, our plan looked to be scuppered even more this week when both winners’ quarter final ties were scheduled for Sunday and a clash with the Whitecaps Reserves game against Portland. Undeterred, and determined to keep our “Road” movie on track, we headed off to Ambleside with the dog and took in the first half hour of the West Van v Surrey United Firefighters match, before shooting along to Swangard for the Caps Reserves. You can’t accuse us of being uncommitted to the cause at least! As it turned out, it proved really hard to pull ourselves away from Ambleside, as the game was a cracker from the off, with end to end play, chances for both teams and some robust tackles flying in from both sides. On paper, this Imperial Cup rematch looked like being the tie of the round and possibly going to produce the eventual 2012 ‘A’ Champions. From what I saw, it was certainly living up to that billing. West Van were unlucky not to take the lead in the opening stages, but some quick reflexes from the Surrey keeper kept out a close range effort. Surrey then came into the game and had a couple of close calls themselves, the most dangerous of which was when West Van goalie Brando Ciccone tipped an inswinging Steve Kindel corner onto his own bar. The Imperial Cup tie between the two sides a couple of weeks ago was settled in extra time, after a goalless ninety minutes. It appeared that this game was going the same way, when Surrey got revenge for their Cup Final defeat. With less than three minutes remaining, a West Van defender turned into his own net, giving Surrey a place in the semi-finals away to PoCo United FC of the FVSL. It’s going to be another cracker of a match and Surrey will have their work cut out against the number one seeds, but they seem to be on the form to make it happen and we’ll be cheering them on next round. Disappointing not to see the end of the game, but the Caps were calling. Still, with the Reserve game over, we headed over to Sutherland High School in North Vancouver to catch the majority of the NVFC Campobasso v Shaheen FC quarter final. The North Vancouver rivals served up a cracker of a cup tie. Entertaining throughout. Both sides have just won promotion from their respective Second divisions to Division 1 of the VMSL next season, and if this game is anything to go by, then it’s going to be a rivalry worth watching going forward. NVFC Campobasso feature ex Whitecap Dever Orgill in their line up, and the Jamaican international was certainly their star of the show yesterday, which you would expect at this level. The 5pm kick off, coupled with the timing of the Caps Reserves game, meant we got there ten minutes in to the game and Shaheen were already a goal up. It was a perfect start for Shaheen, opening the scoring in the first minute. Ali Kashfia played a give and go with Sepehr Khorassani, and as NVFC goalie Riley Janzen came off his line to narrow the angle, Kashfia brilliantly lobbed him for 1-0 to the visitors. Campobasso then took the game to the visitors, but Shaheen had a good chance themselves when Janzen was forced to tip a free kick over the bar. The home side came closest when Orgill drilled a low, fierce, 30 yard free kick, which the Shaheen keeper, Mohammad Ali (Sohrab) Khorassani, did well to turn round the post for a corner. With half time fast approaching, they finally got the breakthrough their play deserved, in what was to prove to be the game changing moment. Shaheen’s Ali Kashfia went from hero to villain when he handled Leo Savino’s bicycle kick on the line and the referee had no hesitation in not only pointing to the spot, but also issuing a straight red to the Shaheen player. Orgill stepped up to score the penalty and the teams went in at the half level, but with the home side now having a huge advantage. They made that advantage pay around ten minutes in to the second half when Orgill was put through and his pace was no match for the Shaheen defence and he easily finished, for what was to prove to be the winning goal of the game. Campobasso had a couple of half chances to kill things off, but to Shaheen’s credit they stayed in the game and controlled a lot of the second half, despite being a man down. They pushed hard for the equaliser in the final minutes, and although they came close on a couple of occasions, they couldn’t find another way past Janzen in the home goal. So a hard fought win for NVFC Campobasso and they will now face Burnaby’s Europa FC (BMSA) at home, in next weekend’s semi-final, and we’ll be there again to cheer them on. 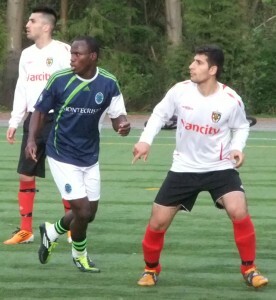 There was still time for one more game, and AFTN’s Steve Pandher took in his third Provincial Cup tie of the weekend when he headed to Newton Athletic Park in Surrey on Sunday evening, for the last remaining match of the round, as he reports below. It was a proverbial tale of two halfs as FVSL side Surrey FC Coyotes defeated Richmond Athletics of the RSSA 2-1 in the Men’s ‘B’ Provincial Cup draw. The Coyotes fell behind in the first half to the Richmond League Champions before scoring twice in the second to advance to the semi-finals next week. The Richmond side applied heavy pressure on the Coyotes right from kickoff, causing multiple turnovers, but were unable to convert those chances into goals. With less than ten minutes to go in the first half, Richmond opened the scoring off one of these turnovers, as Tait Frier was sent in alone and fired a strike past the goalkeeper. Surrey FC came out after the break a different side and they carried possession for the majority of the second half. It took them only ten minutes to equalize, when Adi Negri collected a pass just outside the box and sailed the ball between the bar and the goalkeeper’s outstretched hands. The pressure continued from the Surrey club but they continued to miss the target and the match looked as though it would be heading into extra time. Then in the 88th minute, as Richmond were setting up a wall, Mick Sara took a quick free kick, catching the Athletics’ goalkeeper off his line and giving the Coyotes their first lead. Richmond came close to equalizing in the five minutes of injury time, including a one on one break, but were unable to alter the scoreline. The Surrey FC Coyotes now advance to the semi-finals of the “B” Provincial Cup where they will face the Richmond All Blacks, who were runners up to the Athletics in the RSSA. The semi-final line ups are completed by the Under 21’s and Masters competitions, where both of last year’s champions are still looking to repeat. 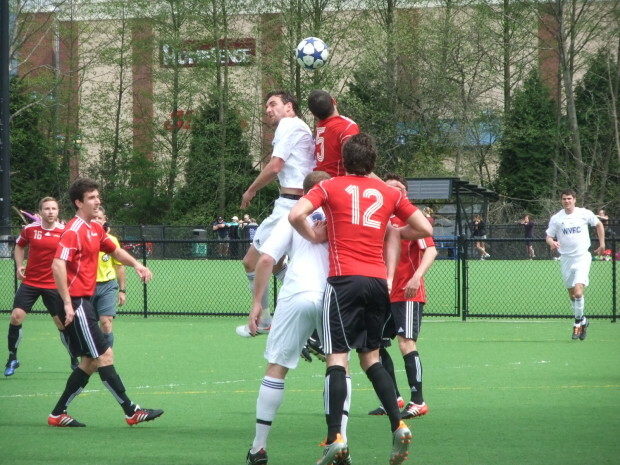 Port Moody Gunners (FVSL) v Gordon Head Gold (VISL), and Rino’s Vancouver (VMSL) v defending champs Victoria Highlanders (VISL), will battle it out for the two final spots in the Under 21 competition. Whilst in the Masters competition, Westside FC (VMSL) take on PoCo Castillans (FVSL) and U-Vic (VISL) will face defending champs West Van FC (VMSL), for a place in that final. Full details of kick off times and venues can be found HERE, when available. With the Whitecaps away at Columbus next Saturday, and the Residency teams now having a free week after their matches against Seattle were moved to June, next weekend’s semi finals will be an ideal live footballing fix for all Caps fans. We were hoping to take in all four ‘A’ and ‘B’ Cup semis (and the Highlanders U21 one) if the fixture gods allowed. That’s looking a little bit more complicated now, with most of the games being played on Sunday, but we should provide some coverage from at least three, if not all four. We’ll definitely be at the Surrey United Firefighters game on Saturday and NVFC Campobasso on Sunday for our continuing “Road to Wembley Burnaby Lake” feature. If you’re free next weekend then try and get out and catch at least one of the games on offer. With ex pros and internationals playing, you won’t be disappointed with the quality and entertainment on display.